HUGO BOSS sees sustainability as the interplay between quality, innovation and responsibility and thus as an integral part of its business activities. The guiding principle “we act responsibly” seeks to generate added value for the Company, its employees, shareholders, customers, business partners and society. The Company thus acknowledges the economic, ecological and social impact of its actions. Besides the high quality of products, customers today increasingly demand compliance with high social and ecological standards. By its diverse sustainability activities, HUGO BOSS creates a significant condition for customer loyalty and innovation capacity and thus for the future viability of the Company. All sustainability activities are managed by the central Global Sustainability division, which reports directly to the Chief Executive Officer. 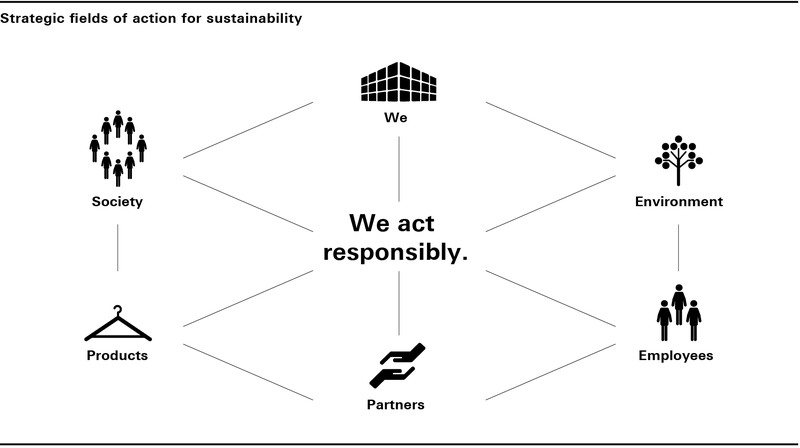 The six fields of action we, environment, employees, partners, products and society provide the framework for the sustainability strategy of HUGO BOSS. We – “Creating values together”: HUGO BOSS engages in regular dialog with its stakeholders. The purpose is to recognize and understand their interests and expectations at an early stage in determining and prioritizing activities. The findings gained also find their way into risk and opportunity management and help HUGO BOSS to enhance its ethical principles and Code of Conduct. Environment – “Preserving natural resources”: The aim of environmental management is to continually reduce the environmental impact of the Company’s activities. The Company’s scope for exerting direct influence covers such aspects as the construction and operation of administration, warehousing and production buildings as well as over the transportation of goods and distribution. It works on the reduction of its emissions and thus contributes to climate protection by employing energy-efficient building concepts and technologies as well as optimized transport routes. The Environmental Commitment of HUGO BOSS, which is published on the Company’s website, describes the principles of environmental protection in all the relevant parts of the Company. Partners – “Achieving joint responsibility”: Complying with environmental and social standards throughout its global supply chain is crucially important for HUGO BOSS and its partners and forms an integral part of contractual agreements. These are based on internationally acknowledged standards and include, among others, rules governing compliance with national legislation, working-hour restrictions, human and safe working conditions, bans on child labor and forced labor, the payment of appropriate salaries and the freedom of association. The Company attaches key importance to the careful selection of partners, cooperations based on a spirit of mutual trust and the maintenance of long-term strategic relationships. Products – “Ideas for tomorrow”: In developing its products, HUGO BOSS applies the highest standards to the quality of materials and workmanship. In this connection, it makes sure that its products do not cause any health or ecological hazards. The Company works together with suppliers and other stakeholders to find innovative solutions for environmental protection and animal welfare. The Company is able to substantially reduce its environmental footprint through the growing utilization of sustainably produced materials, continuous optimization of the use of materials and the application of advanced production technologies. Society – “Promoting perspectives”: The overarching aim of the HUGO BOSS corporate citizenship strategy is to unleash individual potential for success. It is based on three pillars: access to education, career development and creative development. In implementing projects and activities along the value chain, the Company also takes account of regional needs at the individual locations. The Group aims continuously to improve in all fields of action and, accordingly, has set itself corresponding targets. Sustainability ratings act as an objective indicator of the progress achieved. In 2018, HUGO BOSS was added to the Dow Jones Sustainability Index (DJSI) World for the second time in a row. It was ranked “Industry Best” in the categories of brand management, risk and crisis management, occupational health and safety, and tax strategy. In total, the Group ranks among the best four companies in the industry. The inclusion in the DJSI World underscores the success of the Group’s sustainability activities over the last few years.